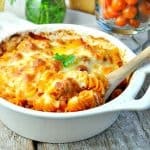 Home » What We're Eating » Easy Appetizers and Snack Hacks! Easy Appetizers and Snack Hacks! Wow the guests at your next party with these Easy Appetizers and Snack Hacks that are perfect for Game Day! From Slow Cooker Sausage Queso to Everything Pigs in a Blanket and Crispy Chicken Tenders, there’s a delicious option for everyone — and nothing requires more than 10 minutes of prep time! It’s football season, and my husband could not be happier! With the Big Game on the horizon, you’re probably already starting to think about what to serve to your hungry fans. 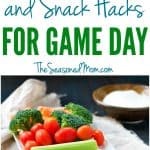 After all, we know that the appetizers and snacks are just as important as the game itself! The good news is that with one stop at Walmart, you can pick up all of the necessary ingredients for your own perfect Tabletop Tailgate. With these 10-minute appetizers, you can stress less and enjoy your guests more! I love efficiency, and this snapshot of my overflowing cart at Walmart shows that I can get everything at once! 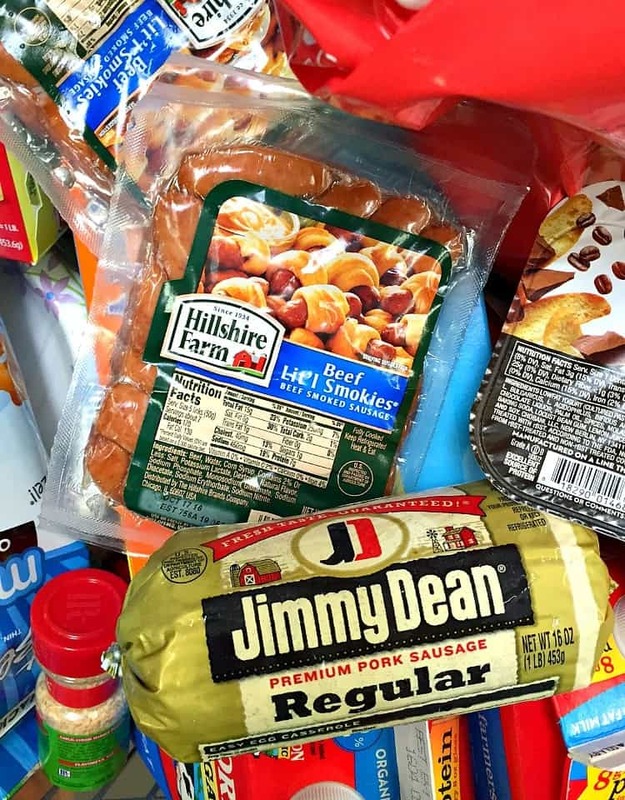 For this particular spread, I grabbed some of our family’s favorite quick-prep options: a giant bag of Tyson® Crispy Chicken Strips, a roll of Jimmy Dean® Roll Sausage, and a package of Hillshire Farm® Lit’l Smokies. Let’s start with Dish #1: Everything Pigs in a Blanket. You hardly need a recipe, but I’ll share one below just in case. These little bites were a huge hit with my boys! Keith couldn’t stop telling his buddies about them, and two-year-old Spence ate 5 or 6 in one sitting! Plus, since the Lit’l Smokies come fully cooked and loaded with flavor, it’s easy to wrap and serve them in just minutes. These are your classic “Pigs in a Blanket,” with the added zest of Everything Bagel seasoning! Just wrap a Lit’l Smokies in some crescent roll dough, brush with butter, and sprinkle with seasoning. And just when you think it couldn’t get better than those little piggies, how about Dish #2: Slow Cooker Sausage Queso?! 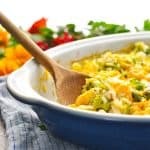 Using the Crock Pot for parties is a convenient solution because you can prepare the appetizer in advance and just let the dip stay warm on the counter while you socialize and enjoy the party. Plus, it doesn’t take up valuable oven space! Just brown the Jimmy Dean Roll Sausage with chili seasoning, combine it with cheese, salsa, and beans, and let the slow cooker do the rest! In a large skillet over medium-high heat, brown the sausage until no longer pink (about 5 minutes). Break up meat into smaller pieces with a spoon as you stir. Drain fat and return sausage to skillet. Add chili seasoning and ¼ cup water to the skillet. Simmer over low heat until water evaporates – about 1-2 more minutes. 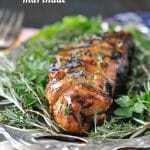 Transfer meat to a slow cooker. Stir in cheese, beans and salsa. Cover and cook on HIGH for 1 hour, or until cheese is melted. Dish #3: Tyson Crispy Chicken Strips served with a 2-Ingredient Honey Mustard Dipping Sauce. You really don’t need a recipe for this one! 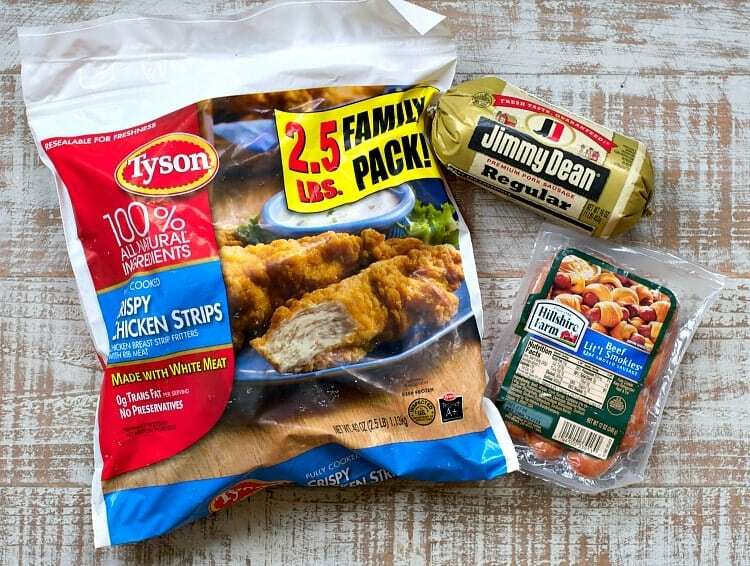 The chicken strips can be found in the Frozen Food Aisle at Walmart, so grab a bag on your next trip and stock up. 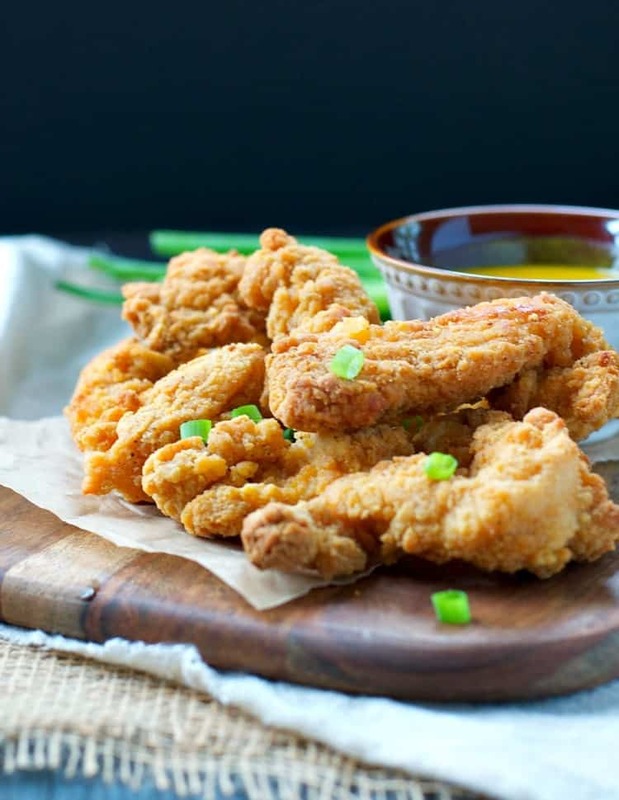 These delicious tenders bake in the oven at 400 degrees, just like the Pigs in a Blanket, so you can prepare both appetizers in one oven at the same time. No juggling, no re-setting your oven temp, and no hassle! I like to serve these appetizers with a Honey Mustard Dipping Sauce that’s made with 1/2 cup of regular yellow mustard and 1/4 cup honey. Whisk together until completely combined and serve! Finally, Dish #4: The Veggie Tray. A party table always looks most attractive when you add some bright, fresh color. 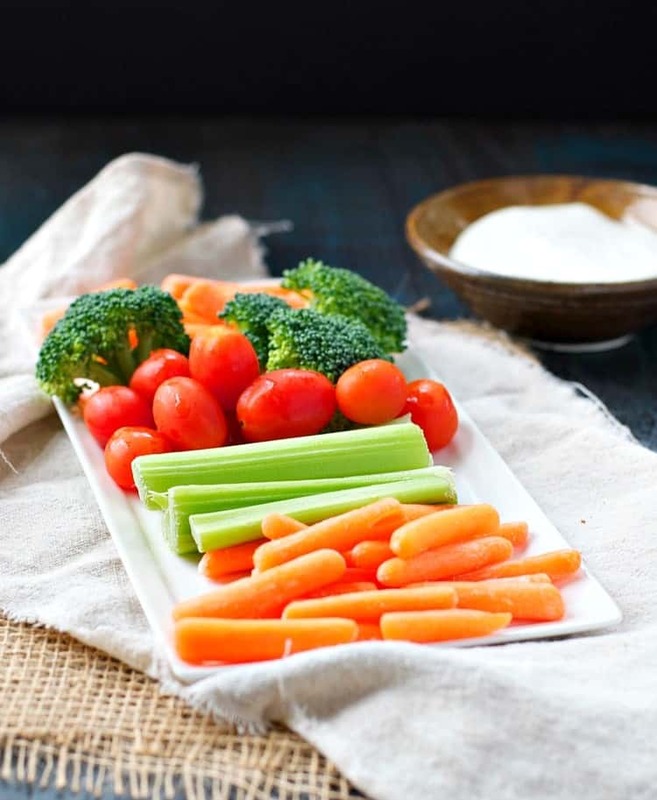 Since I’m not a big fan of standing and chopping endless vegetables (especially when I’m getting ready for a party), I love the ease of grabbing a prepared veggie tray from Walmart’s produce section. It comes with a container of Ranch dip, so I just place the ingredients in my own serving dishes and I’m ready to go. Nobody needs to know that it took me less than 2 minutes! My husband is THRILLED that it’s football season! And hockey, and baseball playoffs for the Cubs haha. We are definitely in need of more game day snacks! Love these ideas, Blair! I’ve got to try that slow cooker queso! Hi Blair! 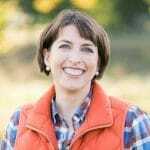 I love appetizer recipes and your blog post came super in handy for me. 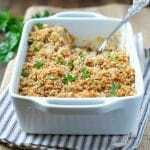 It won’t be too difficult for me to cook this recipe at home since you have put so much details in all the cooking process and the pictures your shared were very useful for me. Thank you for sharing! I love football season and I’m right there with all the guys yelling at the TV, lol. 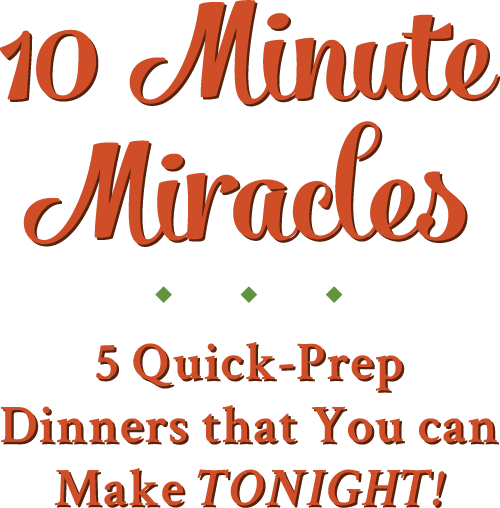 I love to be able to prep ahead and these quick and easy dishes are perfect. Hope you’re enjoying this gorgeous fall weather, friend! I never would have thought of putting sausage in queso – but I can totally see why it would work!